Being a photographer, a painter, or a web designer, one thing is mandatory: You need a portfolio. After all, they are tested with time and is the best way to showcase your work and your methodology to your potential client in a way. And that’s the reason why keeping your portfolio online needs one of the top 15 wordpress portfolio themes. I’ll give you an example. A photographer needs a portfolio to display his best work with categories for featuring different types of photos like black and white or nature-themed. Likewise, a web designer needs a creative portfolio that can be used to show off her latest client projects and even provide space to write about the development process. 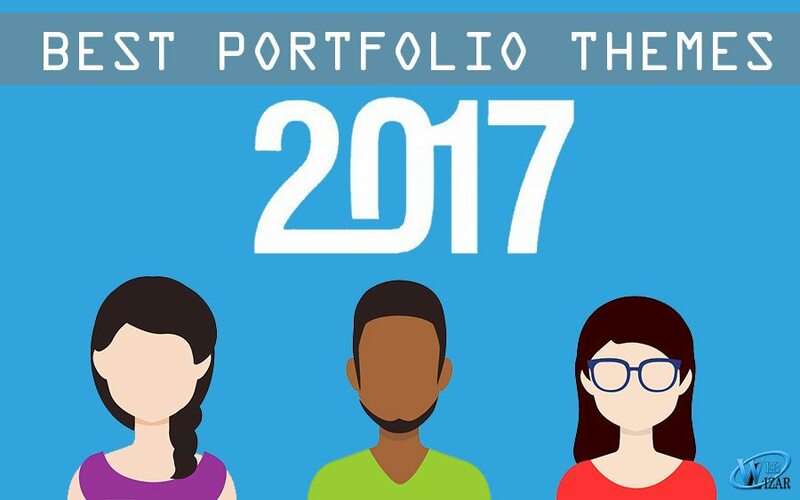 Portfolios can take on many shapes and many styles. But the important commonality here is that they are, in fact, important. If you want to ensure your work resonates with its target audience, and pick up a few new clients or customers, you can use WordPress portfolio themes to build a stunning representation for your work on the web. 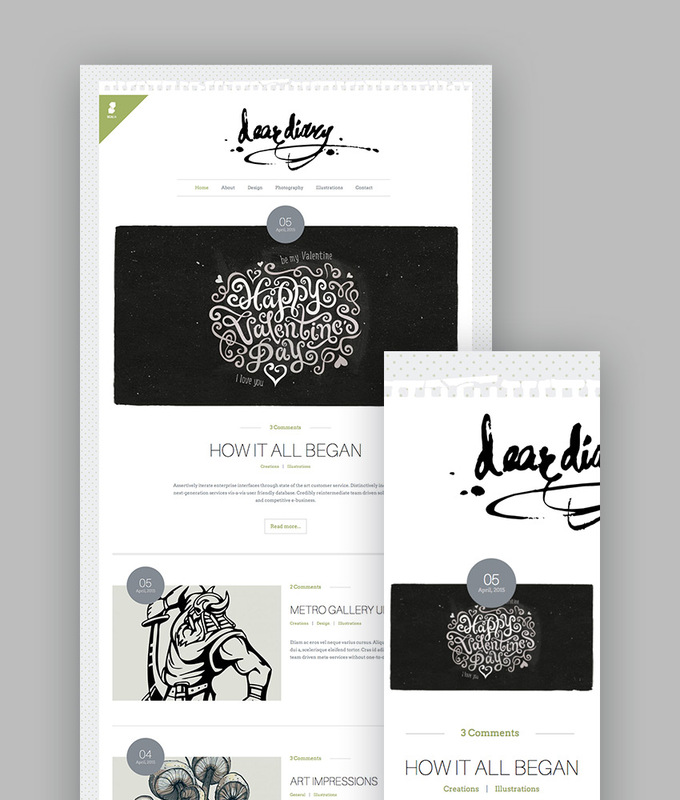 Dedicated portfolio page layouts. These give you the ability to customize the look of your portfolio without having to dig into the code. Masonry, grid, and list options. Because varied presentation options are the spice of life and can help maintain visitor interest. Portfolio item descriptions. This lets you describe each project and give visitors an insight into how you work. Slideshows. Adding an interactive element can pique visitor interest. Parallax sliders and backgrounds. More smooth moving parts create visual interest and support for your work. Video backgrounds. The inclusion of video backgrounds can help engage visitors if you’re taking a storytelling approach to displaying your portfolio pieces. Galleries. 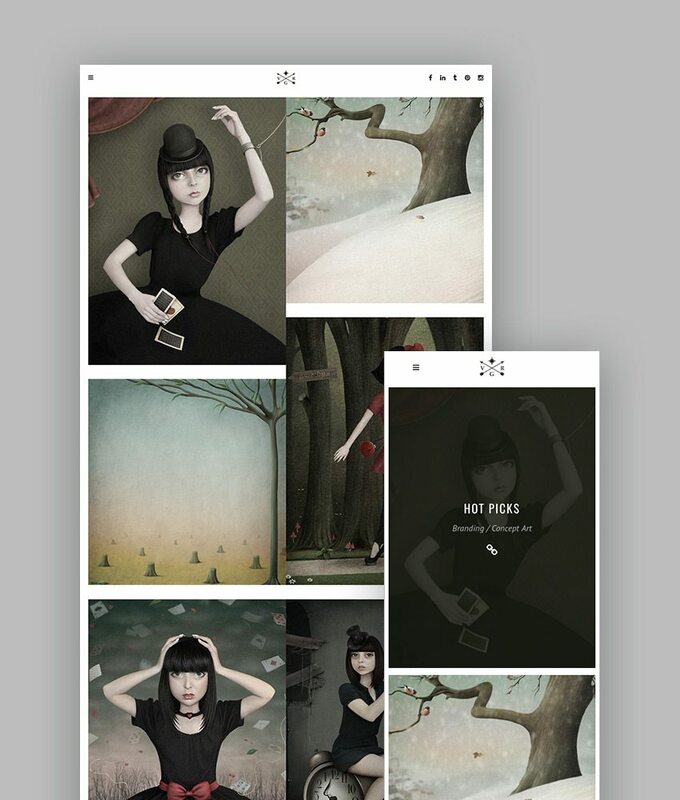 Act as a nice supplement to portfolios and let you display more than one image or video per portfolio piece. These are just a sampling of what many creative WordPress portfolio themes include. Your mileage may vary. But now you have a better appreciation of what to expect as you begin browsing through the many WordPress portfolio themes currently available on ThemeForest. The WordPress themes included here are some of the very best options for creating a portfolio out there right now. And best of all, these are the top sellers, the themes that many people have already tried and loved. Now, while we know the most important aspects of seeking in a wordpress portfolio theme, let us check out top wordpress portfolio themes of this fall. I love a good niche theme, and this one is perfect if your niche is the illustration. Tailored to the needs of illustrators, artists, photographers, animators and so on, this theme showcases portfolio collections and individual pieces equally well. The screenshot below shows the masonry layout, but there are fourteen other homepage arrangements to choose from, as well as a wide range of page templates to make the most of your work. With clean lines and demo’d with cool, calming photography, Argenta is a new theme (February 2017) for creatives in search of that stylish solution. It comes wrapped up with Visual Composer, Revolution Slider, and ACF (advanced custom fields) Pro, a range of portfolio settings, and a host of navigation layout options. If you need to display your creative work online with a robust canvas of options, Ronneby is a great choice! It’s dubbed a high-performance WordPress theme and for good reason. It can be used to create just about any kind of site you want, and is certainly up for the task of making a stunning portfolio. It comes with a versatile set of display options, with over 40 layouts, plenty of portfolio options, numerous demo layouts, and several plugins like Slider Revolution, Visual Composer, and Ultimate Addons for Visual Composer. This responsive and retina-ready theme includes one-click installation, 8 pre-made headers, Mega Menu options, modern typography, portfolio hover variants, 23 portfolio page types, 48 styled widgets, over 1,700 font icons, and it’s WooCommerce-ready. Support and updates are included as well. 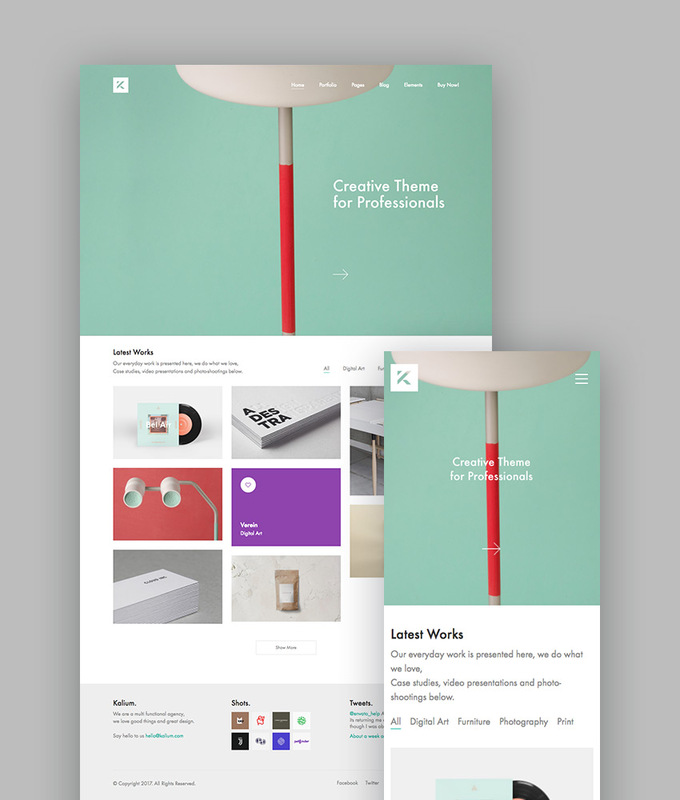 The Kalium theme was designed with creative people in mind, offering a host of features for creative professionals that help them get their work in front of prospective clients. It comes with many pre-made demos that can be installed with a single click, saving you a considerable amount of time. It’s packed with numerous plugins that make designing custom layouts a breeze including Visual Composer, Revolution Slider, and LayerSlider. Plus it comes with shortcodes, can be translated, and supports unique portfolio options including hover styles, Dribbble Portfolio integration, and over 30 portfolio types. Other features include over 700 Google Fonts, unlimited skins, over 800 icons, multiple footer styles, and the whole thing is responsive and retina-ready. This theme packs the features you need to create a stunning portfolio to showcase your creative work! TheFox is a multipurpose WordPress theme that offers plenty of options for creating a stylish portfolio that suits the needs of creatives from all walks. This theme is responsive and super flexible, allowing for numerous customizations to build the perfect site to suit your needs. It comes with loads of demos, plenty of documentation, support, and a video tutorial for quick setup. Also included are 30 homepage designs, over 250 design details, a robust theme options panel, Visual Composer, Premium Slider, and a shortcode generator. You also get a one-click demo importer, Mega Menu, WooCommerce compatibility, CSS3 animations, unlimited colors, header options, and so much more. 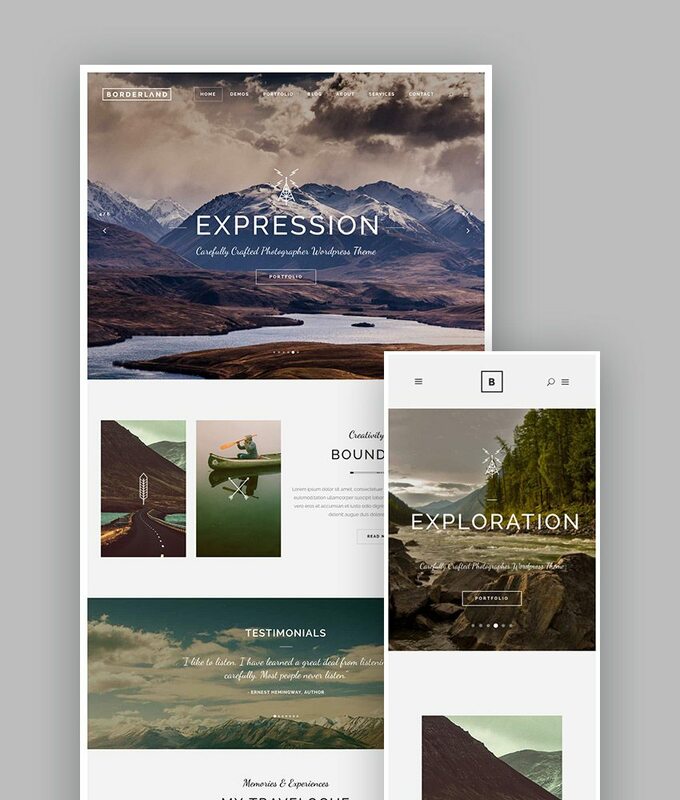 A flexible and robust WordPress folio theme to display your best creative work. 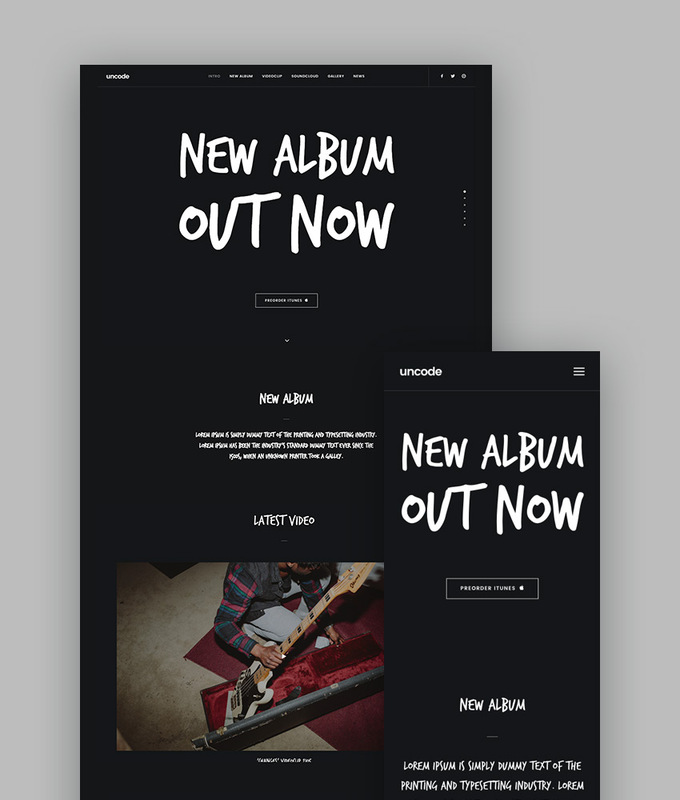 Another best-selling WordPress portfolio theme worth checking out is Uncode. This theme is multi-use, so it can be configured to suit just about any purpose. However, it comes packed with loads of portfolio features sure to please creatives of all types: designers, illustrators, photographers, and more. It also includes several high-quality plugins like Visual Composer, Layer Slider, Revolution Slider, and iLightbox. It’s WooCommerce compatible and WPML ready. It comes with 20 homepage layouts, a full admin options panel, grid layouts, over 6 menu styles, and dedicated portfolio and blog templates for total control over your design. 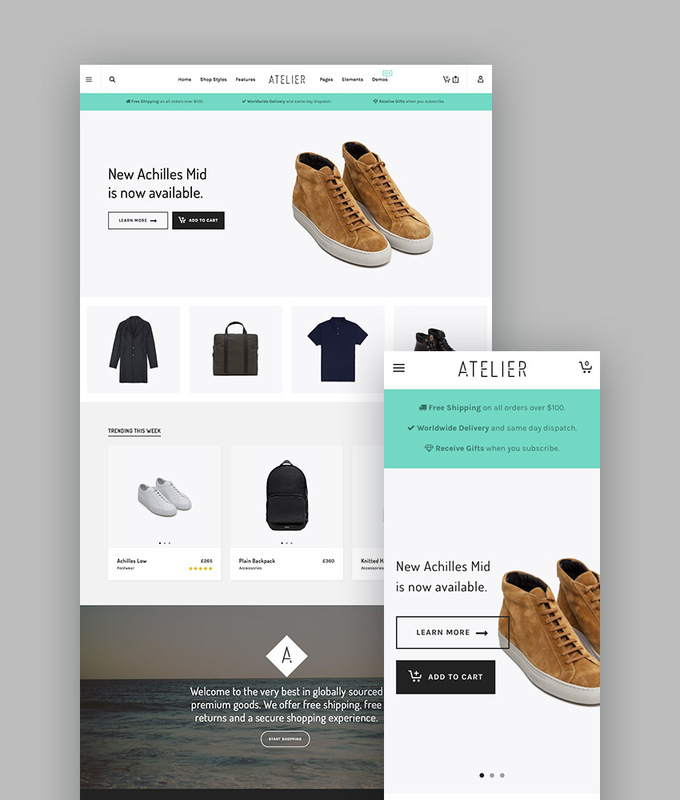 While the primary focus of the Atelier theme is e-commerce, it’s also perfect for portfolios and comes with the features to back up that claim. This theme comes with 12 demos that can be installed with one click, a minimal design, speed and SEO optimization, and a responsive design. This also packs in 10 different header types, animated headers, 5 cart animations, multiple product display types, and drag-and-drop page builder. It features Visual Composer compatibility, numerous page types including portfolio and blog. You can make quick use of its shortcodes, RTL support, Mega Menus, and more. Scalia is another best-selling WordPress theme that offers multi-concept solutions for businesses, shops, and creatives. 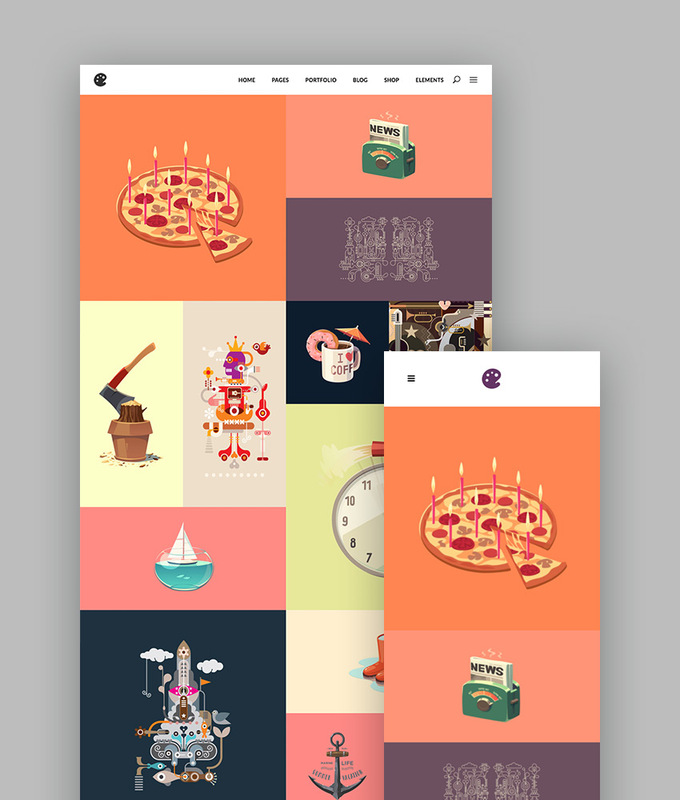 This theme’s numerous portfolio layouts and gallery options make it a great choice for displaying your creative work. It features five different designs to suit varying tastes and includes 100 unique page templates. There are 8 blog styles, multiple shop pages, quick finders, and more. It also comes with Visual Composer, Mega Menus, and a responsive design. It’s robust and ready to be extended with WPML, sliders, and WooCommerce compatibility. If photography is your outlet of choice, you’ll love the PhotoMe theme. It comes jam-packed with over 50 gallery and portfolio layouts, one of which is certain to fit your next project. It also comes with 8 demos, all of which can be imported with a single click and supports a multitude of options and portfolio templates for customizing your site to best display your work. 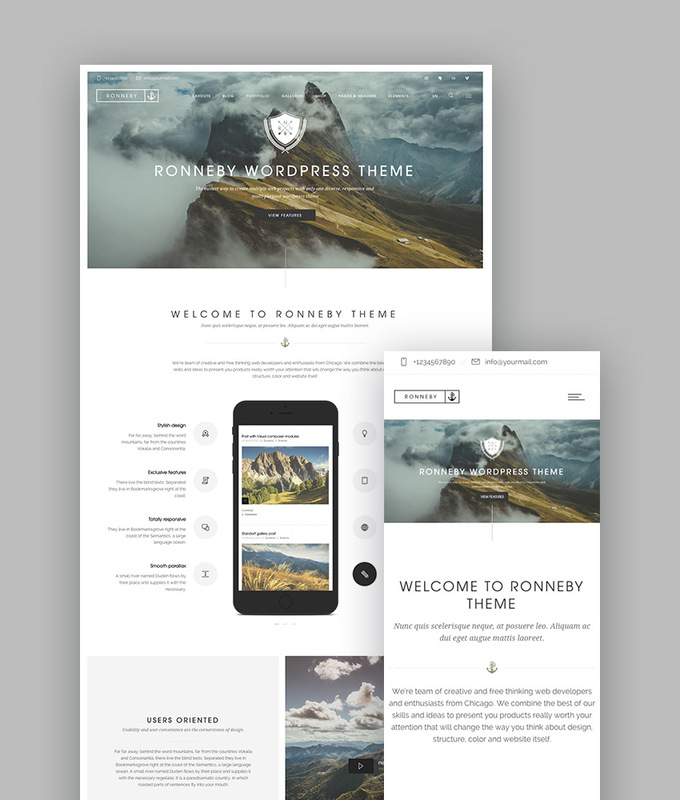 This theme supports the Live Customizer, features a responsive layout, comes with a Content Builder, blog templates, and a one-page layout. It also packs in Revolution Slider, WooCommerce support, and includes support and documentation. 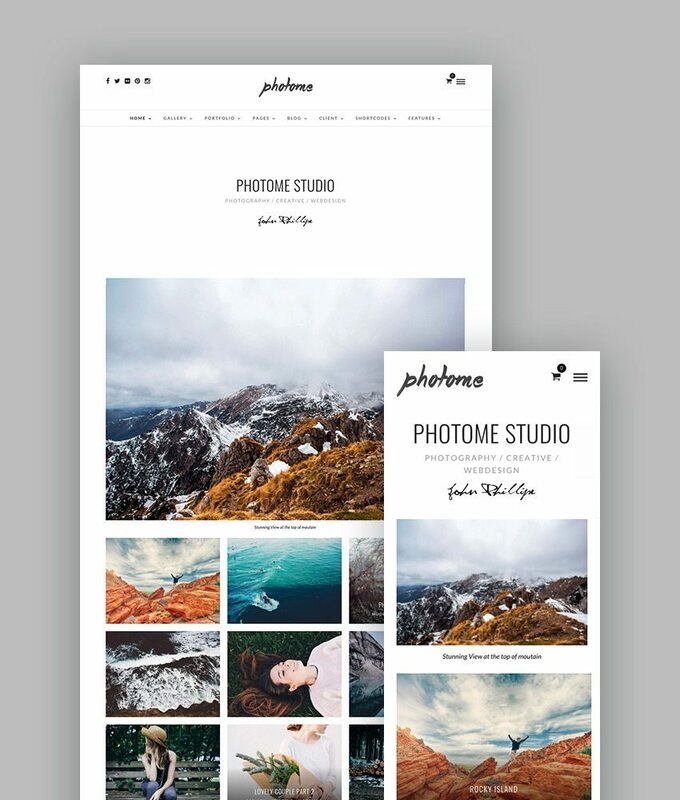 PhotoMe is a feature-rich theme you can use to set up your photography portfolio online! The last theme to make our cut of the best-selling portfolio WordPress themes is Vigor. 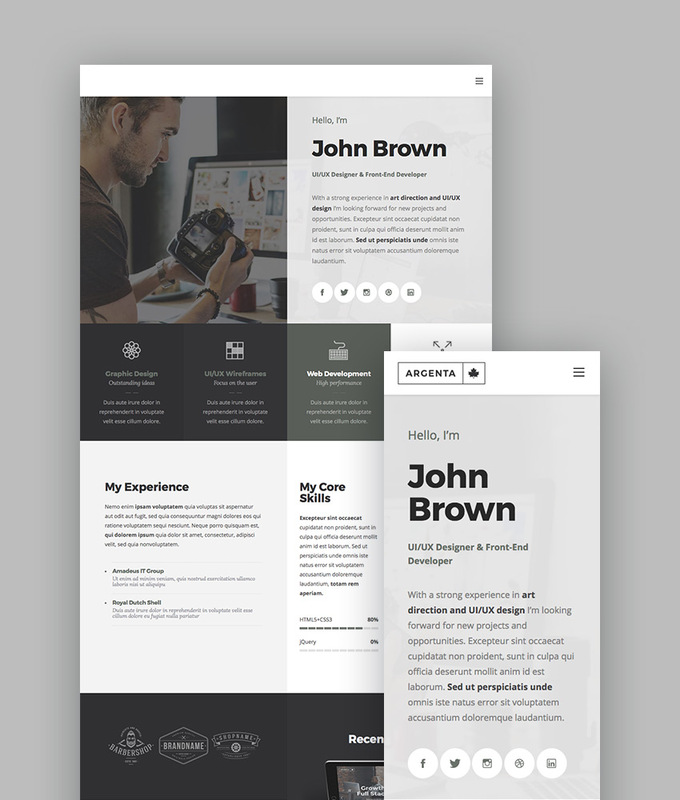 This theme is easy to customize and ideal for creating a compelling portfolio that truly captures attention. If you want your portfolio to stand out online, this is the theme to grab! It comes with a powerful admin interface, multiple header layouts, Edge Slider, parallax, animations, a masonry gallery, fullscreen menus, Mega Menu, and video backgrounds. As well as great visual display options, like LayerSlider, Visual Composer, portfolio lists, single items, and sliders, a client carousel, and pretty much everything you’d ever need to display your work in style online. 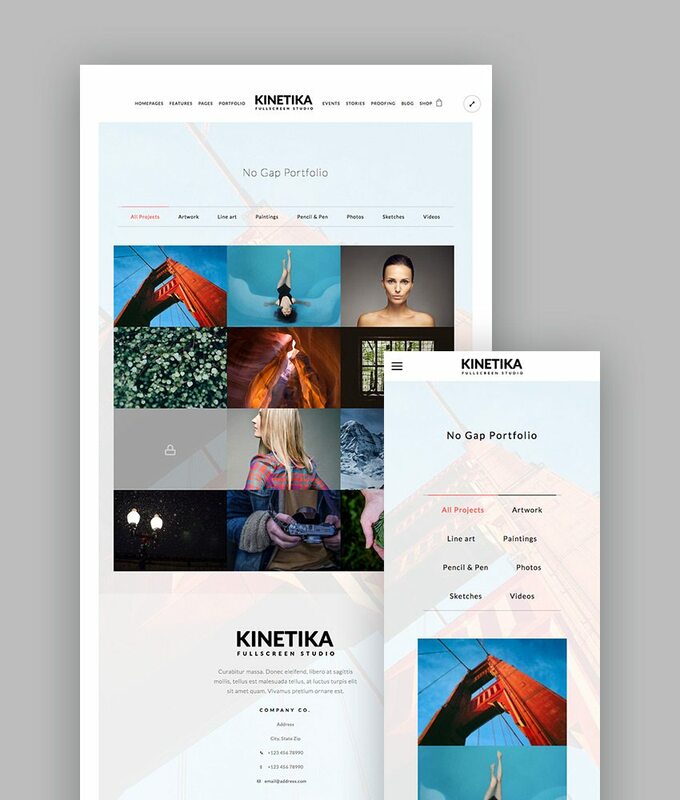 Kinetika is a fullscreen photography theme that includes numerous gallery and portfolio features that allow for the creative display of your latest and best works. If you’re a photographer or need to display your work at full-screen, then this is a great WordPress portfolio theme to start with. It includes a promotion box, a portfolio and blog carousel, fullscreen slideshows and videos, and a proofing gallery. You’ll also get slideshow text, multiple headers, video page backgrounds, and a fullscreen menu. And it packs in Revolution Slider, WooCommerce compatibility, WPML compatibility, as well as optimization for speed and SEO. Borderland is a creative WP theme that can be used for a variety of purposes, but we’re focusing on its portfolio features today. Borderland comes with 12 beautiful demos that can be imported with a single click, WooCommerce shop compatibility, Ajax page transitions, Fullscreen Elated Slider, a clients carousel, and a testimonials shortcode. It features numerous layout options, such as portfolio single templates, portfolio list layouts, hover animation effects, multiple blog layouts, sliders, and custom post formats. You can also put parallax backgrounds, video backgrounds, and a number of additional features to work. Grab this WP theme today to create a stylish portfolio and to standout on the web! So, these are our list of top 15 wordpress portfolio themes. Hope you liked them and maybe one out of the lot can be the theme you were looking for from a while. Apart from that, if you haven’t how to Become An SEO Superstar For Your Blog you can read them out here. This blog post covers up some Do-It-Yourself Tips and Tricks for SEO and yes you should definitely Meet Doctor Roy.